Travel two million years back in time and position yourself 200 km northeast of Shark Bay on the present-day Kennedy Ranges. All around you the sediments of an ancient long-dry seabed are weathering away and being carried to sea by a network of tributaries and rivers, or blown there by strong winds. By the time they reach the end of their journey at what is now Shark Bay these sediments are quartz grains – sand. As this sand accumulates against a series of long high ridges, the remains of a weathered anticline, it is shaped into rolling dunes. Present-day Peron Peninsula is made from the sands blown against the Peron anticline between two million and 10,000 years ago. This wind-blown deposit is known as Peron sandstone. The red colour of this sandstone is due to a thin iron oxide coating around the sand grains. 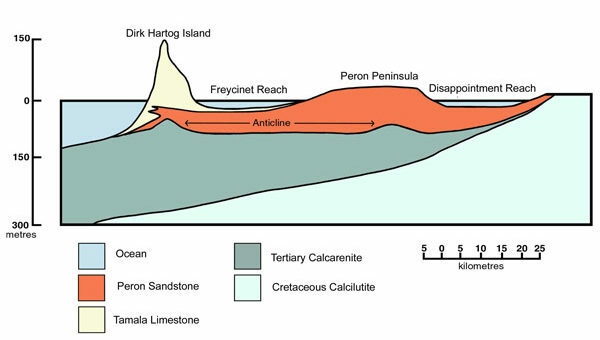 Peron sandstone underlies most of Shark Bay but is only exposed on Peron Peninsula and Fauré Island. The white sands comprising Edel Land Peninsula and Dirk Hartog, Berniér and Dorré Islands were deposited between one million and 10,000 years ago and overlay Peron sandstone. These white sands are known as Tamala limestone and are made from broken shells, corals and skeletons of marine organisms originating west of present-day Shark Bay. During the Pleistocene Ice Age 125,000 – 10,000 years ago, sea levels were many metres lower than they are today and wide expanses of the continental shelf were high and dry, exposing shell and coral deposits. 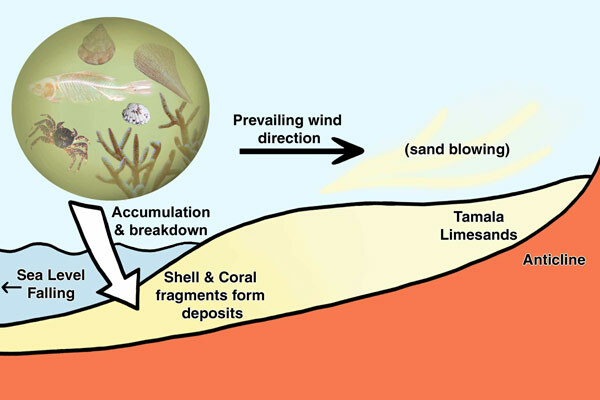 Strong southerly winds eroded these shell and coral deposits into sand particles which were blown into immense dunes as they accumulated against a long ridge underlying present day Edel Land and Dirk Hartog, Berniér and Dorré islands. In many places, particularly along the Zuytdorp Cliffs, the sands cemented into solid rock. Named after a Dutch East Indies merchant ship wrecked in 1712 the Zuytdorp Cliffs form the western edge of the Shark Bay World Heritage property. Towering up to 200 metres high and stretching more than 200 km from Steep Point to Kalbarri, they are the longest fault scarp in Australia. Pounded by the Indian Ocean with wave-cut benches, blowholes, spouts and slips, these dramatic cliffs are a World Heritage value. The Zuytdorp Cliffs are made of Tamala limestone which stretches down much of the West Australian coastline. The cliffs formed about 5,000 to 10,000 years ago when the Earth’s crust shifted along a fault line during an earthquake. The peninsulas, prongs, islands, sea cliffs, bays, claypans, dunes and beaches of Shark Bay are the result of winds, waves, sea level changes and earthquakes. During the Quaternary period over the last two million years there have been cold glacial phases and two warm interglacial phases. 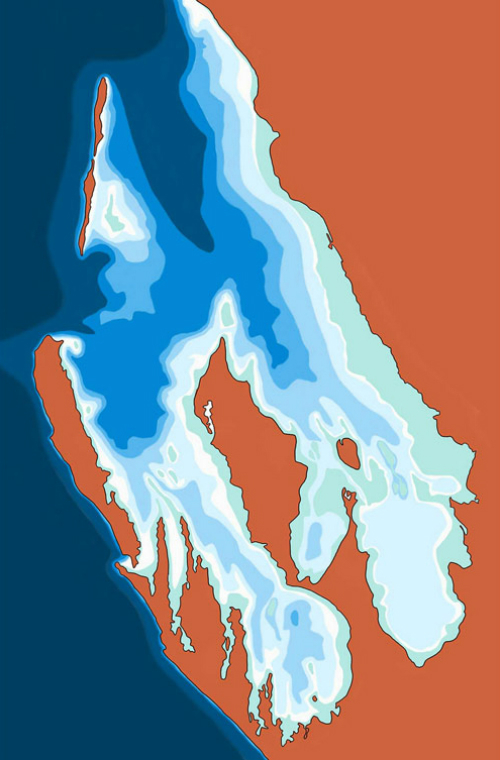 It was during the most recent glacial phase that much of Shark Bay’s surface geology formed. About 125,000 years ago much of the Earth’s water was frozen in ice sheets, the sea level was much lower than it is today and the coastline was further west. About 10,000 years ago the Earth entered its most recent interglacial period and melting ice caused sea level rises that flooded depressions on either side of Peron Peninsula. This filled the valleys between Edel Land’s giant sand dunes and islolated Dirk Hartog, Bernier and Dorre Islands from the mainland. Bernier and Dorre Islands then separated from each other 3,000 to 6,000 years ago. Birridas were landlocked saline lakes between sand dunes when sea levels were higher than today. A drop in sea level dried the lakes and left the salty hollows we know as birridas today. They range from circular or oval depressions about 100 metres in diameter to elongated depressions several kilometres long. 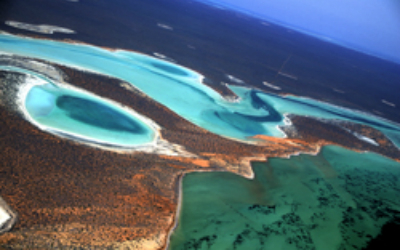 They are among Shark Bay’s visual attractions and ‘superlative natural phenomena’ – reasons for Shark Bay’s World Heritage listing. When the birridas were lakes, sulphate of lime (calcium sulphate dihydroxide) was deposited onto the lake floors. When the lakes dried up the sulphate of lime evaporated and became powdery gypsum. 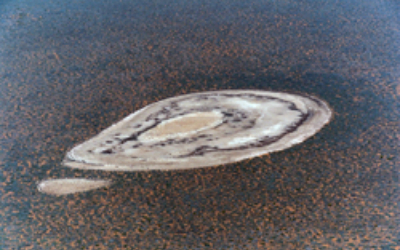 Birridas commonly have a central raised platform ringed by a moat-like depression. 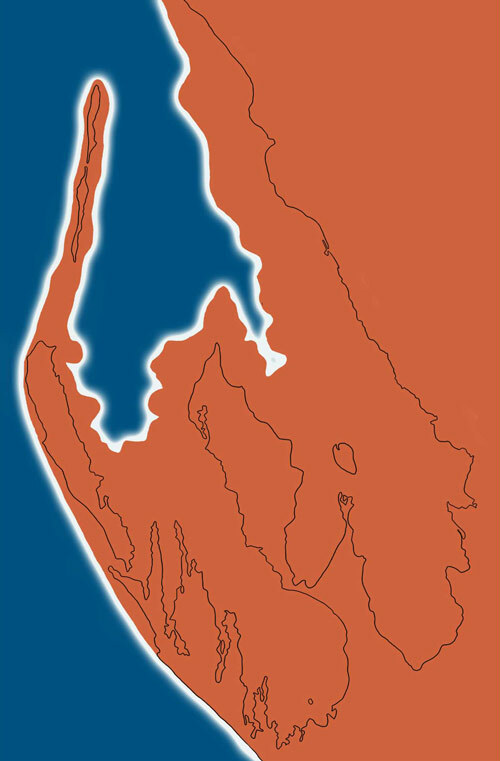 The central section corresponds to the level of the water table during the late Pleistocene, about 10,000 years ago. The moat formed when fresh groundwater seeped from the surrounding dunes and dissolved the gypsum on the periphery of the central platform. During ice ages, including the one about 10,000 years ago, the coastline was up to 100km further west than it is today. On this diagram land is orange, the approximate coastline is white and blue is ocean. Today the highest winter tides raise groundwater levels enough to fill some moats. Although the water is usually quite shallow, most birridas retain water for several months following rain. In these conditions dormant eggs hatch and the birridas teem with small invertebrates such as horse-shoe crabs and brine shrimp. Migratory wading birds like ruddy turnstones (Arenaria interpres) and bar-tailed godwits (Limosa lapponica) feed on these crustaceans. Birridas are common in Francois Peron National Park where there are more than 100 on the east coast of the Peron Peninsula. You can see birridas when driving but to appreciate their magnificence in the landscape it is best to take a scenic flight. Most birridas at Shark Bay are isolated from the sea but a few are connected to the sea by channels. Shallow bays result where this occurs, for example at Big Lagoon in Francois Peron National Park. These bays are important fish breeding and nursery areas. Samphire (Halosarcia sp.) is the plant most associated with birridas. Salt tolerant Chenopods growing around birridas include Frankenia sp. and silver saltbush (Atriplex bunburyana). Sandalwood (Santalum spicatum) occurs on the slopes surrounding birridas.